Front and Rear 1000W Hub Motor Kits with PANASONIC 48V 10.4Ah Tiger Shark Battery. 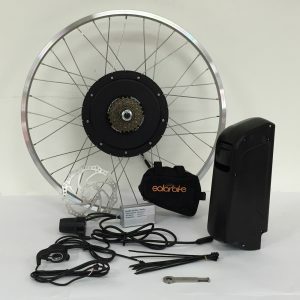 The high power kits use the direct drive larger motor, these are able to withstand the high power output given off by the controller and battery combination. 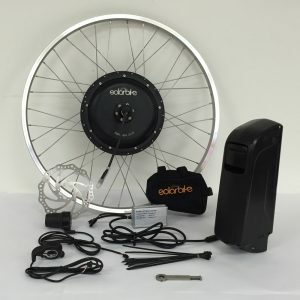 We have these kits available in front or rear wheels in 26″ and 700c rim size. You should have steel rigid forks if you with to use a front motor, otherwise using a rear motor is a better option. You need to install the torque bar provided no matter where you choose to install it. The high power allows a speed upward of 40km/h so you’ll get moving nicely for those off-road adventures. The battery used in this range is the new Tiger Shark design, it mounts within the frame of the bicycle. The high power to weight cells 3500mAh recently released by PANASONIC have allowed us to use a neat battery mould that fits within the frame of the vast majority of bicycles. 200W is the legal limit for riding on the road.